I am heading toward a 3 year anniversary of marriage to my wife Melissa. I am approaching my 40th birthday on August 5. As I read this passage this morning, laying next to my 13 month old daughter, I began to reflect on all the differing opinions given to me of who I am to be, whether they were given to me by others or by myself. My parents birthed me and raised me to be a Christian. My molestor wanted me to expected me to be a homosexual male. My mind told me to be all man, which meant strong and promiscuous. Football told me to be aggressive. Pain told me to be emotionless; Strength told me to be logical. The military told me to be violent, loyal, decisive. Addiction told me to be secretive. Ministry told me to be "holy"
Becoming a husband and father was frightening for me. My mythologized picture of a husband and father was not who I am. I pictured a husband and father as damn near perfect: the perfect priest of the home, the perfect provider of provision, the perfect protector from evil, the perfect shoulder for tears, the perfect back for burdens, the perfect binder of wounds, the perfect healer of hearts...pretty much Jesus Christ himself. I am not Jesus. In trying to be my myth, I was rejecting myself. I read this very differently now. In Matthew 5 Jesus is preaching his Sermon on the Mount. In the audience were the poor and oppressed, the Roman oppressor, the tax collecting sell-out, the Pharisaical "holy" men, the sick and untouchable. Blessed are YOU when you: are meek, make peace, rejoice or grieve, are reviled, are merciful, are pure, are persecuted, are slandered, are poor in spirit. To whom is Jesus speaking? He is speaking to people who are not what He has described. Their normal way of being is not in line with what He is saying. And yet they are blessed when they, hard-hearted and twisted though they be, do what He is describing. He calls them salt, light, an unhidden city on a hill. WE are the salt of the earth. WE are the city on the hill, even when we ourselves don't feel safe. We are the light of the world...and we are not perfect. We have a perfect Jesus. When we let our light shine, we let Jesus shine through US, broken spots and all. This means we don't try to hide our weakness, neither does it mean we broadcast it. There are candles which give off certain scents when burnt, and flames are know to burn with differing colors depending upon what is being burnt and how hot the fire is. I am a unique person: I have a unique family tree, nationality, history, strengths and weakness combination which will never be reproduced. When I am filled with the Spirit of God, and He burns bright in my life, I AM a unique light in the world, because the Holy Spirit is living His life through my unique and specific context. I am not asked to be anyone other that myself. I am not asked to focus on hiding my flaw or my pain, but rather I am to spend my time focusing on showing Jesus through my uniqueness. Jesus isn't given in a vacuum, neither is Christianity lived in one. This verse speaks to a value and a worth differentiation. A clay pot is not as valuable as gold. Clap pots are know to chip, crack...some can even look all around unsightly. When gold is placed in them, their cracks, flaws, reveal the treasure inside. If there were no cracks, the gold would be hidden within, known to be there only by the One who placed it there. No, God does not place the treasure of Jesus within us to hide Him, but so that He may be seen by all. This means He places this treasure in cracked pots like you and me on purpose. Kintsugi (金継ぎ?) (Japanese: golden joinery) or Kintsukuroi (金繕い?) 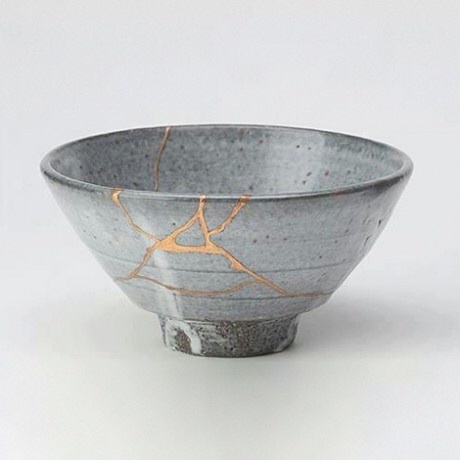 (Japanese: golden repair) is the Japanese art of fixing broken pottery with lacquer resin dusted or mixed with powdered gold, silver, or platinum a method similar to the maki-e technique. As a philosophy it speaks to breakage and repair becoming part of the history of an object, rather than something to disguise. I tell you about myself because I choose to, not because I need to. Those who are not mended need to tell others of their issues because they seek healing. However, those who have bend restored by the gold of Jesus inserted in their brokenness need not defend themselves, nor prove themselves. Their revelation, should they choose to reveal, is not done as testimony, not as request. I don't have to tell you how the crack was made, how the vase of my life was broken. Yet, when you see me, and you see gold in certain areas of my life, you know automatically that there, behind the Gold of Jesus, is the hiding of my power. The glory of my broken pot is that Jesus is what holds me together in ways many may never know, nor need to know. That is what we are, broken and repaired people with a glorious history, called to be authentically us, to wear our wounds proudly because of the treasure within. We are light who burn brightly with unique and specific color and odor, to reveal the manifold grace of God.